Sabal palm trees; photo by thesix on Flickr (noncommercial use permitted with attribution / share alike). Sabal palm trees grow up to 20 m in height. 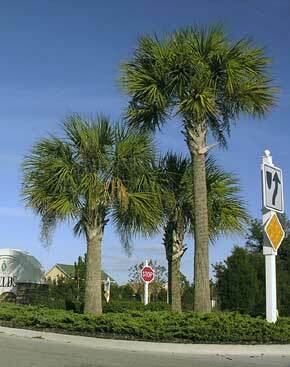 Sabal is a fan-palm native to the southeastern United States, Cuba, and the Bahamas. Sabal palms are extremely salt-tolerant (can even grow where washed by sea water at high tide) and are often seen growing near the Atlantic ocean coast. The hardy sabal palm tree is also frost-tolerant and can survive short periods of temperatures as low as minus (-)14 °C. The growing heart of the new fronds (also known as the terminal bud), gives the palm tree its "cabbage" name, since this can be harvested as a food and resembles a cabbage head in shape (this is the key ingredient for a "heart of palm salad")" This was a common food for native Americans, but this practice is very destructive because it will kill the palm (the terminal bud is the only point from which the palm can grow and without this bud the palm will not be able to replace old leaves and will eventually die). 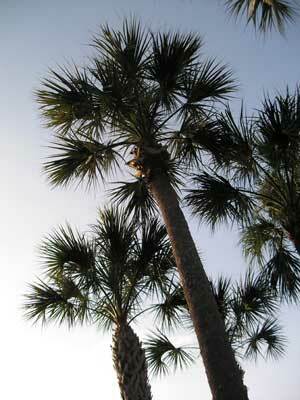 Sabal palm trees (public domain image on Wikipedia). Video of The Sabal Palmetto!